Large companies and global enterprises are gradually embracing digital transformation by leveraging digital endpoints. These allow them to communicate and engage with their employees globally in an effective manner. It’s never been easier to communicate with employees across different time zones due to the advancement and lowering costs of technology and software. The best enterprises are setting themselves apart from their competitors by adopting digital transformation strategies. Moreover, they understand that the global business landscape is shifting in favor of companies that truly embrace change. At Signet, we strive to offer companies bleeding edge technology and valuable advice so that they can propel their businesses to the next level. Enterprises have been increasingly adopting digital endpoints across their global workplaces. They’re learning to use them better by connecting them to one platform instead of relying on closed systems that control just one type of endpoint. 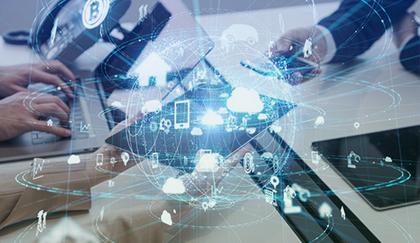 Furthermore, IoT devices connect easily to an unified management platform that allows the curation of content in real time. It’s also simple to deploy and manage custom-built applications for various business functions across these devices. Employees from different company departments can access this unified management platform and leverage it for their needs. They can manage and share analytics, applications, and content with other staff members across the entire company. That’s why companies are investing heavily in technologies that facilitate the deployment of communications across their digital endpoints and IoT devices. Companies are always looking at ways to enhance and streamline their content pipelines connected across their digital endpoints. They understand the benefits of automating content instead of having a large number of employees handling entry manually. By integrating their main systems such as CRMs, intranet, HR systems, facility management systems, and messaging and social platforms, companies can easily automate tasks and reap the benefits. Likewise, content and messaging between various company departments are possible on a daily basis due to these integrations. Customer support and network operations centers can transfer mission-critical data in real time to better serve their clients and partners. Communications between an enterprise’s internal teams no longer have to follow a static strategy. Advancements in communications for newer digital endpoints make it easy to stay connected with individual employees. Furthermore, it’s easier to segment content and distribute it to specific company locations or digital endpoints. To help facilitate smooth communications, modern enterprises should assign communications managers to handle certain tasks. They can personalize individual messages sent to employee smartphones, which fit with their interests and interactions. The degree of personalization depends if a message is external or internal when sent to a digital endpoint. At times, it may be less personalized since it’s meant for brand messaging, but more personalized when sent to employee laptops and smartphones. Current video conferencing platforms have improved functionality and lower entry costs than their equivalents in previous generations. Due to these advancements, these technologies have entered many spaces in the workplace and no longer reserved for the boardroom. Now, it’s possible to inform, interact, and inspire employees present in huddles and touchdown spaces. It’s also easy implementing a content management strategy whereby messages sent to employees in real time include vital information such as critical meeting information, video conference bridge information, and wireless key sharing. Whether an employee is an executive or a truck driver, they may not reach an office during a normal workweek. Nevertheless, modern enterprises that have adopted a comprehensive digital strategy can easily connect with these remote employees. As more people work remotely, spending less time in the office and more time in their cars, favorite coffee shops, and homes it’s important to extend communications to their laptops and smartphones. In Conclusion Leading enterprises understand that to stay competitive requires the adoption of new technologies that facilitate efficient and rapid communications. Tying up all digital endpoints to a single content management system, automating content, managing employee communications, utilizing video conferencing platforms, and reaching out to employees in remote locations are key drivers to success. Contact us to learn how a good digital transformation strategy can benefit your business.